At the Law Offices of Thomas More Holland, we represent pedestrians injured in accidents involving cars, trucks, buses, subways, trolleys, Els and other vehicles. 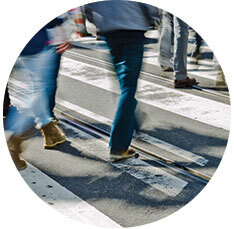 Pedestrian injury cases are different from other cases, and generally require additional investigation to confirm the identity of all of the witnesses. There are often questions about which insurance applies and, most importantly, pedestrian claims have to be presented very carefully so that the insurance company, judge and jury understand why the vehicle that hit the pedestrian was negligent and responsible for the person’s injuries. That is why if you, a family member or friend was struck by a car, truck, bus, motorcycle or other vehicle, you need an attorney who understands the law, will fight aggressively for you, will keep you informed, and will make sure you get all the benefits and the largest award you deserve. That lawyer is Thomas More Holland. At the Law Offices of Thomas More Holland, we do everything we can so that our clients who are injured receive all of the compensation and benefits they deserve. Yes. Pedestrian accidents cases can be complicated, and the insurance companies have lawyers who work for them. You need an attorney who understands the law, who will work aggressively for you, and has handled these cases. Attorney Thomas More Holland has represented pedestrians injured by cars, buses, trucks, motorcycles and other vehicles for more than 20 years, and the attorneys and staff of the Law Offices of Thomas More Holland have the knowledge to handle your case.